Front entries work best if they are generous, easy to see and follow and can accommodate two people, side-by-side. This one meets all those requirements, leading one to the front door, through the garden (yet to come) making it both practical and a lovely garden walk at the same time. 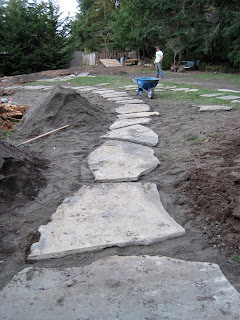 Very large stepping stones will lead visitors to Lois' front door. Brad, Joe and Josh do some heaving lifting to put them in place. The new entry porch is finished and waiting for a new front door. Matt working on interior details uses the new porch for his "work shop". 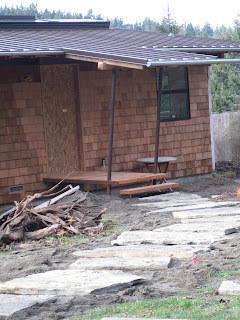 The house evolves with the new porch adding a great outdoor space to it's function and improved appearance. Appliances in place; cabinets in place; drawers and fronts will be in place on Monday; counters and island soon. Think about this...how about recycling a home in it's existing footprint? Tearing it down entirely or changing it beyond reconnection by expanding it into an impossibly large home is the industry standard. Sustainable? Not at all! 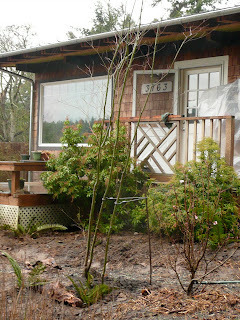 That this small, plain, chopped-up house that lived small, now has drama, open spaces and lives big is amazing! But, what's even more amazing is that this was done without adding even one additional inch of square footage. Sustainable? Yes, indeed! Footprint? Unchanged! In the typical remodel, square footage is used to add livability when all too frequently it can be achieved by creative use of the existing spaces. Opening up rooms by eliminating walls; adding light with the use of skylights, more windows or glass doors; changing traffic patterns; and creating indoor/outdoor relationships are all ways to achieve "big" while staying small. 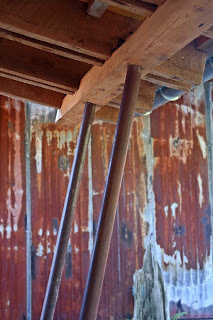 Sustainability requires that we carefully and creatively examine the spaces we use in our homes. More square footage adds to more cost, more materials, more land, and more space to maintain. Why? When, making better use of space is really what matters. How efficient does a home live? How much privacy can be created in small spaces? How can one work at home comfortably? How can one enjoy openness and light while having cozy spaces at the same time? Although this project is not yet finished, one can already see how this home has blossomed and grown from an ugly duckling into a swan. The south end of the home -- once a dead spot, with only one window, becomes a "feature". These double doors were once in the kitchen but in changing the kitchen layout and the front door of the house, they became surplus. In the spirit of recycling they were added to the south end of the house providing light to the home's interior and Lois' studio. By adding a glass roof and small deck, with metal fencing (screening) to come, this spot is turning into quite the spot -- the spot to capture the sun, the spot to pause out of the rain, the spot to sit and contemplate one's work, the spot to enjoy the garden. 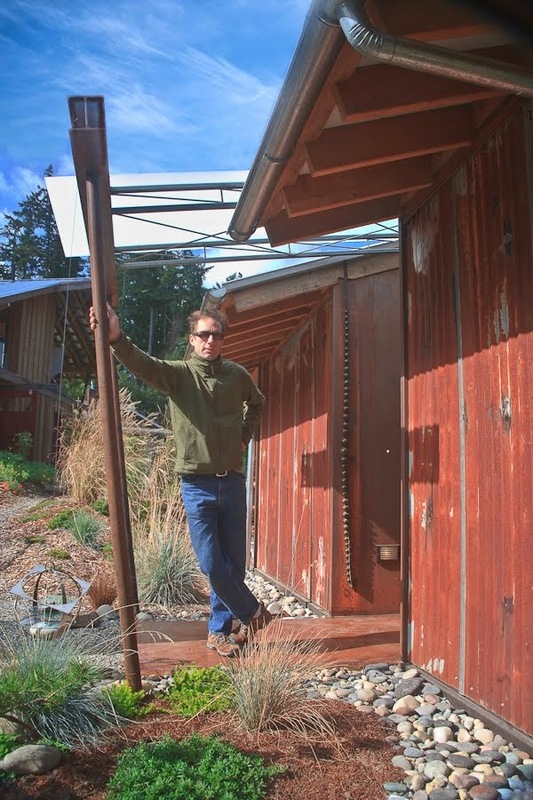 One recycled door, one small deck, one small roof equal Wow! Living in the NW can be a challenge of protecting our forests -- celebrating our trees -- on the one hand and having enough sun around our homes to protect against dreary, depressing dark sunless days. It's also a challenge to love the rain yet provide spaces to be out of the rain. To create transitions between indoors and outdoors that can be enjoyed year around is all too often ignored in the NW home. 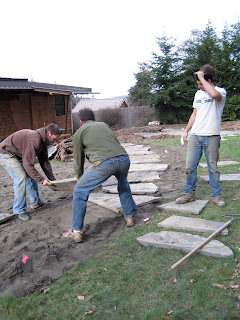 This hole-in-the-ground photo (below) is preparing the way for the support of a small roof at a double glass door, with small deck, on the south side of Lois' home. On sunny days, as well as overcast days, this spot, with a glass roof porch, will always be full of light. Because this door and deck are off Lois' studio, it will also be a spot to recapture creative juices when they're running low. Although it isn't "solar energy" as we've come to think of it, it's using the sun for warmth and light. 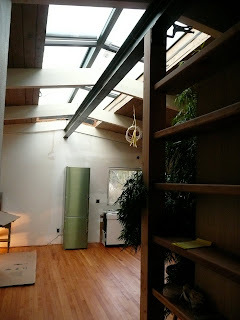 A "hot" spot, created by the glass roof, providing light even on a cool winter's day. Remember this old roofing gleaned from the Langley Fairground a couple of summers ago? It was used on the siding of the Fredley projects's mainliving building. This pile of the same roofing is waiting to be turned into a new fence at the Lois project. 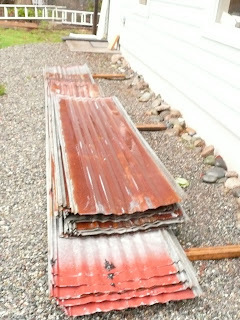 This beautiful old metal roofing was destined for the landfill without Brad's intervention. What a find! Waste to beautiful siding and fencing. How often we hear about the NW's understory being just weeds. Or the logs and branches just waste to be eliminated. Here's proof. Nearby the Lois remodel project, Brad spied this load of "waste" shortly to be hauled off to the landfill (before burning was forbidden it would have been burned, polluting the air, for days and days and days.) Brad inquired of the machine operator if he could have this "waste". "Sure" was the reply. "It's just junk, take it." Just junk it is not. Not when one understands what makes healthy soil. This forest duff, along with the logs and branches, will be added to the disturbed soil at the Lois project. The logs will become nurse logs, growing moss, ferns, huckleberries. This junk will absorb rain and more gently put the water from the rain into the soil. This pile is anything but junk. To a person understanding soil this pile is pure gold. 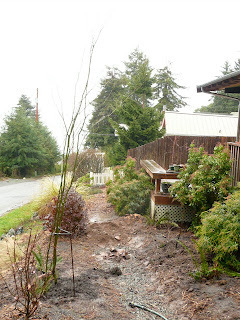 To develop privacy between the home and the road a berm has been built and is now getting planted with vine maples, ferns and other native plantings. The vine maples and ferns have been generously given to Brad by his father who owns land having huge supplies of both. Lois has been working with Brad of dbbrad and Fran Abel Landscape Consulting to achieve both a functioning and beautiful garden. 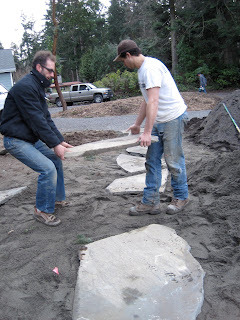 Restoring the construction site and the soil to pre-building condition is an important part of any construction project. Construction compaction, drainage and beauty all need to be repaired once land is disturbed. Leaving bare ground will create runoff problems, erosion problems and noxious weed problems. Canadian thistles, Scot's broom and blackberries love nothing better than bare land. If you do not take control, nature's "repair" plants will move in. Although they do a great job, given hundreds of years, they will be a problem for the homeowner and the neighborhood in the short term. Alders, for example, are very important plants for setting nitrogen in destroyed soil but few home owners want a grove of alders at their front door. Take charge and help mother nature along. Once we disturb land we then have both an opportunity and an obligation to repair it. We must all be gardeners to "fix" the land and return it to it's pre-construction condition. Try to think like a forest floor. Duff is created from plants of all sizes, from huge trees to moss all working together -- breaking down, rotting, entering an animal to be eliminated by an animal -- all to add to the duff, tilth, habitat, drainage, and beauty of the land. Just keep mulching to add to the soil and control unwanted plants. Have you ever walked through a healthy forest when it's very, very cold outside? Or when it's very, very hot outside? Outside the forest, in clearings, parking lots, cities, and many neighborhoods the wildlife is quiet, the leaves on plants are curled and stressed, the heat or cold is almost unbearable. Enter the forest, just feet away from that hostile unforested environment to feel and hear the difference. The environment is healthy and alive showing little stress from extreme weather conditions. Heavy rain is quickly absorbed into the ground; wildlife is active and the bird sounds are happy and strong; and the plant leaves are not shriveled. Elliott Menashe of Greenbelt Consulting has been helping people in the NW for years to understand the forest's function. Before clearing the land is the prime time to pay attention to how the forest processes our water by filtering it and returning it to the aquifer, supports our wildlife and provides the beauty we all love in this evergreen state. 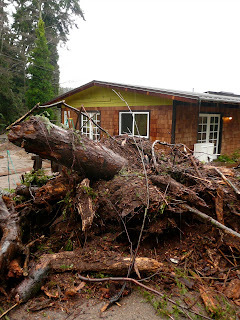 All construction projects, new or remodels, create this opportunity to protect the land where it can be protected and to repair the land where the damage was unavoidable. And, the fun...wow! Watch it happen from the first moment you get dirt under your fingernails. Warning! Gardening is addictive.